Pickaweb boasts a quality site builder and impressive online support, but it’s still a little overpriced. Founded way back in 1999, Pickaweb is a UK-based website hosting provider which currently provides services for more than 20,000 customers. Pickaweb's shared hosting starts with a very restrictive Budget plan. It's £2.49 ($3.25) a month, but this gets you only 5GB of disk space, a single email account, no databases and no one-click installs. There's even a 30GB per month data transfer maximum, a real surprise when most companies have no restrictions at all. To get unlimited bandwidth you'll need Pickaweb's Pro plan. £6.99 ($9) a month also provides unlimited email accounts and databases, and enables hosting as many websites as you can squeeze into its 25GB disk space. All the accounts include a template-based website builder, are managed via cPanel, and will serve your site from a London-based data centre. The company offers Virtual Private Server plans from £9.99 ($13) a month, and dedicated servers from £119.99 ($155). Both have bandwidth limits with the base plans (2TB VPS, 3TB dedicated), but you can purchase a higher allowance if necessary, and there are plenty of other customisations available. Overall, Pickaweb products are more expensive than most of the competition, but they may still be interesting if you need a London location or UK-based support. The Pickaweb site provides a mass of detail on its various plans, with multiple pages, lengthy comparison tables, even an eight-minute ‘quick’ audio overview. We suspect most people would prefer a better organised website than sitting listening to someone else talk about the products, but maybe we're wrong. Click Buy and you're prompted for the domain name you'd like to use. 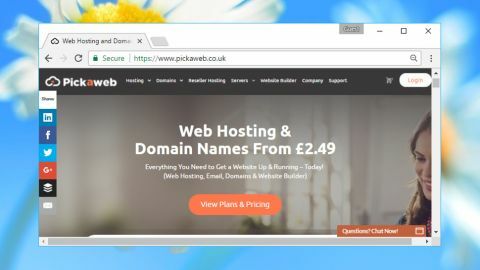 All but the cheapest Pickaweb plans give you a domain registration for free, although you can also use a name you have already. The company offers two main add-ons for its shared hosting plan. The GoMobi Mobile Website Builder is available for £3.99 ($5.20) a month, while a backup and restore plan is available for £3.33 ($4.30) a month. Both are a little more expensive than usual. The headline plan prices turn out to be available only if you pay for a two-year plan. This isn't entirely clear from the signup page as it lists the total prices, not the effective monthly rate (‘£95.76 biennially’ instead of ‘£3.99 a month’). On the plus side, monthly billing is available if you don't want a big upfront bill. If you're happy with the figures, the signup page allows you to pay via credit or debit cards, or PayPal. We chose PayPal, the transaction worked as usual, Pickaweb's site displayed an invoice and gave us a link to the client area. Pickaweb's customer portal is surprisingly stripped-back, and that's not necessarily a bad thing. You don't have to scroll through icons for servers, or domains, or assorted other products you don't have – the portal simply displayed our hosting plan, and took us to its management console with a click. The portal includes a sidebar with links to key site management features, including FTP Management, Email Management and the File Manager. In theory this allows access to these modules without having to browse through the full-strength cPanel. In practice, it doesn't always work. We could create FTP and email accounts without difficulty, but when we tried File Manager, the site hung for 30 seconds, displayed an Access File Manager button, and finally gave us an ‘Error 404’ when we clicked it. The portal interface often felt awkward. If you clicked Access Control Panel in a sidebar you'd expect the Control Panel to open, right? But all it does is display an Access Control Panel button, and you must click that to get in. Pickaweb provides a standard cPanel installation as its main console, and if you're familiar with the system you'll be able to jump in and set up your site right away. Beginners get free access to the SitePro site builder. This has almost 200 templates, all reasonably well designed, if rather more oriented to businesses than home users. It's easy to customise the template or add new media, and there are widgets to plug in content from YouTube, Google (and other) Maps, social networks and more. We didn't spot a limit on the number of pages, or any of the restrictions other hosts often place on free site builders. More experienced users get access to Softaculous, one of the best frameworks around for finding, installing and managing popular applications. There are hundreds on offer – WordPress, phpBB, MediaWiki, Magento, OpenCart and more – and most can be installed within moments. Pickaweb claims to offer 24/7 support by live chat, telephone and email, and says you'll get a reply ‘instantly’. Sounds great, but we were interested to see if the service could really deliver. The live chat system demanded our email address as well as our name. That's not going to matter if you've signed up, but it shouldn't be necessary for sales queries. We opened a chat session anyway, and asked if the Pickaweb site builder had any limits on the number of pages we could use. An agent replied almost immediately, and although he was a little vague ("I think there is no limit" – you ‘think’? ), the answer was essentially correct. The website says: "We are available via phone 24x7. We will reply to you instantly". So we dialled the phone number, but what we got was a repeating recorded message saying ‘for instant tech support, use live chat on the website’. We'd called out of regular 9-5 hours so perhaps someone would have answered at another time, but support is certainly not available via phone 24/7 as claimed. Email was next. We despatched a message asking why the customer portal's Access File Manager button gave us an ‘Error 404’. Would they have an answer? A little over an hour later, a reply arrived: "You can access cPanel from the client area and the links to access other services will not work. But you can access all of them via cPanel." We knew the links didn't work, and it seems Pickaweb does, too. It's not a major technical hassle, but we'd prefer a company which addressed issues – even small ones – rather than just expecting customers to live with them. Moving on to the web knowledgebase, we tried our regular ‘import WordPress’ searches. The algorithm wasn't particularly intelligent: that search returned very few relevant answers, but changing tack to ‘transfer WordPress’ was much more effective – and there was a lot of content overall. The quality level was well above average, with the knowledgebase featuring clearly written pieces that were cross-referenced with other articles; more like a good wiki or blog post than the rushed pieces we often see elsewhere. Other searches were just as successful, and the way results are presented is very well implemented. As we started to type ‘permissions’, for instance, matching titles appeared underneath, and we could select one immediately. If we didn't see a clear match, hitting Enter displayed a Google-style page of matches with titles and the first three lines of each article. It's a smartly designed system which makes it much easier to find what you need. If there's a small issue, it's that some of the content is more dated than we'd like. For example, searching for Outlook returned a bunch of documents for Outlook 2010. But this is a common problem with web hosts, and Pickaweb seems less affected than most. We rounded off our tests by running Bitcatcha and a few other speed tests on our server. It was UK-based, as promised, and delivered good connection speeds from the UK and US. Performance was slower over long distances, as expected, but the overall results were very acceptable. Pickaweb is a little overpriced. The site builder, 24/7 chat support and impressive knowledgebase are definite plus points, though, and if you need a London-based host it's worth a look.